The Volcano is an independent printed newspaper in British Columbia distributed four times a year. The Volcano reports on low-income, working-class, and Indigenous peoples’ movements for justice throughout BC, supporting their resistance against structures of poverty and displacement. We hope you will join us in supporting this important publication, which continues to impact movements for justice within and between communities by amplifying their analysis and demands. Please see an invitation to their upcoming fundraiser below. On Saturday April 16th 2016, The Volcano is hosting a fundraiser and we’d love for you to come! We’re asking attendees to pay by donation, whatever you can, with a suggested donation of $15 per person. Join us for dinner at 6:30pm and enjoy an evening of music, poetry, conversation, and a silent auction to top it all off. As a newspaper we have covered ongoing struggles from the Unist’ot’en Camp to the Downtown Eastside. We draw the links between displacement struggles across BC and focus on events that mainstream media often ignore, like the tent cities in Abbotsford, Maple Ridge, and Victoria. We are looking for your support in order to continue to do this work, deepen our coverage, and expand our distribution. 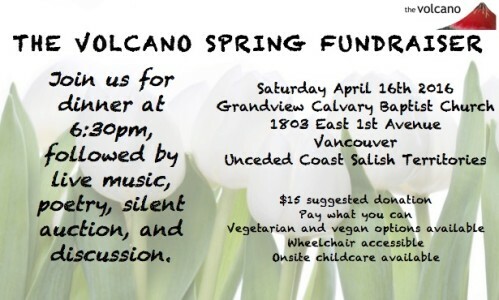 Where: Grandview Calvary Baptist Church hall at 1803 East 1st Ave, Vancouver, Unceded Coast Salish Territory. You can enter the space off of 1st Ave (south side of the buildings) or on the North side of the building. Accessibility: The church’s entrance on the North side of the building is at street level. This also grants access to the washrooms. One washroom has a stall that can accommodate a wheelchair. The washroom door opening is 86 cm and the stall door is 61 cm.